The Yamaha CP88 is a powerful, intuitive live stage piano that brings all of Yamaha's sonic tradition and design experience into a modern, h.. The Yamaha CP88 is a powerful, intuitive live stage piano that brings all of Yamaha's sonic tradition and design experience into a modern, highly playable keyboard for almost any live situation. Yamaha CP88 features an awe-inspiring selection of world-class Grand Piano, Electric Piano, Organ, Orchestral and Synthesizer sounds, paired with a new Graded Hammer Action keybed. The end result is a stage piano that is geared for life on the road, with all the elegance of Yamaha's infamous Grand Piano designs. The Yamaha CP88 features a huge array of legendary grand pianos under the hood, all sampled and re-modelled with painstaking attention to detail. 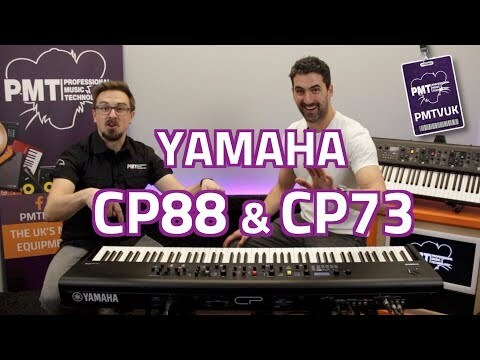 CP88 includes the Yamaha CFX, U1, SU7, CP80, 76 RD, Bosendorfer, S700 plus many more Piano models. Courtesy of its USB audio interface, the CP88's onboard Pianos can be continually updated with the latest content from Yamaha and the worldwide community, or why not design an arsenal of custom presets that suit your signature sound? With 160 Live Set sounds, each overwritable with your own modifications, there's more than enough to cover every mood, genre and timbre. With innovation powered by Yamaha's unrivalled Piano tradition, the new CP Series Pianos set a new benchmark for what a live stage keyboard should offer. The Yamaha CP88 employs a brand new Yamaha BHS Keybed that offers balanced Hammer Action, and features matte black keytops for an authentic piano touch. When playing music, the feel of an instrument has a strong bearing on the musician’s performance. Yamaha CP series stage pianos feature finely tuned keys for every use. CP73 employs balanced hammer action with an equal key feel across the spectrum, granting keyboardists perfect control over their tone regardless of sound choice. The Yamaha CP88 features one knob settings that allow you to fine tune synth parameters with one touch. Yamaha's focus on an intuitive, hassle-free live performance workflow is evident in the control pattern, linking every element on the instrument’s surface to exactly one function under the hood. There is no navigating of menus and submenus, every function can be controlled directly – a great advantage when adjustments need to be made quickly, reliably and intuitively in hectic live situations. The Yamaha CP88 has been designed primarily for touring musicians and keyboard players that gig on the road. Weighing in at only 18kg, its manageable to travel with. An official yamaha CP88 Soft Case is available separately!